Next message (by thread): [NetBehaviour] book WRITING UNDER available! 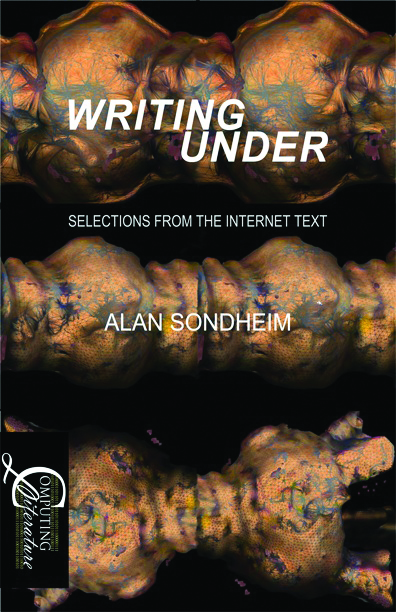 > Alan Sondheim pens WRITING UNDER: SELECTIONS FROM THE "INTERNET TEXT"
> Alan Sondheim pens Writing Under: Selection from "The Internet Text"
> writing as it takes place on and through the networked computer. > writing online is entitled "The Internet Text." > the world and its 'genesis redux' in their grip." Christopher T.
> the real world has in the virtual. > or phone (800) 621-2736. > and its 'genesis redux' in their grip." > leaving multiple re-reads a definite must." > Internet since its very beginnings needs to read this book."